The Centers for Disease Control in Atlanta, Georgia reports that estimated 6-7 million people have been, or are currently sick with viral flu during the current flu season. Half of these individuals saw a health practitioner for their illness but nevertheless approximately 69,00-84,000 people were hospitalized. Much of the illness and deaths from the flu are the result of bacterial infections that often accompany the disease (secondary infections) and excessive inflammation. Unfortunately, a total of 22 influenza-associated pediatric deaths have been reported during the 2018-2019 season to date. CDC expects flu activity to continue for many more weeks or even months, and it continues to recommend flu vaccination and antiviral medications for high-risk groups such as children 5 years of age (but especially those younger than 2 years of age), older adults, pregnant women and residents of long-term facilities. Not everyone experiences the same flu symptoms, but symptoms range from chills, severe cough, sudden and high fever, stuffy, runny nose, severe aches and pains, bad headache, extreme fatigue, vomiting and/or diarrhea. Some people go on to develop serious complications caused by viral infection of the nasal passages and throat and lungs. The presence of virus and bacteria triggers a robust inflammatory response in the body’s attempt to rid the body of disease. Inflammation is the body’s primary weapon to destroying pathogens, but it is a double-edged sword since “uncontrolled” inflammation in response to the virus may result in significant lung damage, followed by death. 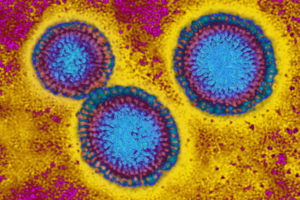 It has recently become apparent that during influenza infection, large numbers of inflammatory immune cells leave the lungs and travel to the small intestines. Here they interact with the microbiome (communities of organisms that occupy the gut) destroying the proper the balance of beneficial organisms and permitting the overgrowth of certain classes of bacteria. Inflammation is the protective process by which the body removes harmful pathogens and substances and initiates healing. It is a tightly regulated process that involves molecular signals that start and maintain inflammation (pro-inflammatory) followed by signals that turn “off” the inflammatory process (anti-inflammatory signals). Imbalances of these immune factors results in damage to the tissues and organs. A properly balanced immune response is essential for the body to combat viruses like influenza and the bacteria that too often are associated with the illness. Wash your hands frequently and keep them away from your nose and mouth (mucous membranes). Stay hydrated to keep membranes moist and resistant to invasion. Be physically active 2.5 hours/week. Be smart—eat healthy, especially vegetables and fruits. Try to get outdoors a few minutes a day. Cut down or quit smoking—your lungs are working hard enough trying to bring oxygen into the body. Consume a proven immune support supplement to help your immune system balance. Enhance your quality of life. Dr. Hellen can be contacted by using this form, at drhellen@drhellengreenblatt.info or call her at: 302.265.3870 (ET, USA).